CASHMERE, Wash. — Family and friends gathered for a candlelight vigil on Friday evening to remember 14-year-old Rafael Morelos, who hanged himself on Sunday, Jan. 29. Rafael was openly gay, and friends said he was bullied because of it. Rafael’s mother, Malinda Morelos, said said she did not know that her son was bullied until students at another vigil earlier in the week told her. 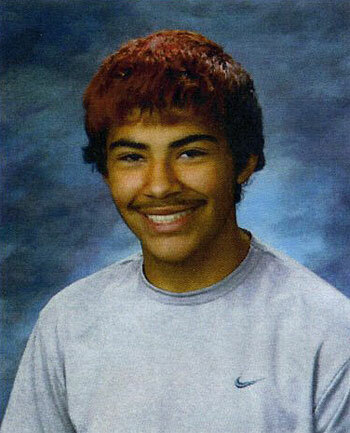 “Almost all the kids here told me he was being bullied,” Morelos told the Wenatchee World. Morelos said she had known for several years that her son was gay, but that he kept his feelings to himself — she said she she had no idea what he was going through. “He told me he got shoved and punched in the face in PE in the locker room at Cashmere,” said Lexii Mullin of Wenatchee, a friend of Rafael Morelos. “He was tired of people saying that his little brothers would follow in his footsteps and be gay too,” said Maranda Blankenship of Wenatchee. In a statement issued Friday, the Cashmere School District said they were deeply saddened by the loss and their thoughts and prayers were with Morelos’ family. The Chelan County Sheriff’s Office investigated the case and determined that it was a suicide and there was no foul play involved. Rafael’s death is the fourth reported suicide in January among gay teens that has been attributed in part to anti-gay bullying. On Jan 1, Jeffrey Fehr, 18, hanged himself at his family’s home in Granite Bay, Calif.; on Jan. 20, Tennessee teen Phillip Parker, 14, was also found dead, the victim of an apparent suicide — his parents said Phillip was constantly bullied because he was gay. And on Jan. 11, Eric James Borges, an intern at The Trevor Project also took his life — EricJames, as he was known, was repeatedly bullied, tormented and terrorized for most of his life. His religious-extremist parents chose not to attend his memorial.